Linux Lite 3.8 has been released, yaaaaay! And upgrading from 3.anything-below-eight is a snap. Two mouse clicks, enter your password, and the magic happens. Linux Lite has the bestest, most wonderfulest and awesomeful back-up utility in the history of ever installed by default. It’s called systemback and it creates restore-points, which are like snapshots of your entire Linux Lite system. You can even include all the stuff in your /home directory if you want. I have systemback scheduled to make new backup snapshots once a week (but you can do it daily, hourly, whatever you want) and store them on that second hard drive (/DATA). You can even make your snapshot bootable and store it on a thumb drive! Systemback won’t be maintained after 3.8, so they are clooking to replace it, probably with Timeshift (also awesome), but I intend to retain it for use long after it’s unsupported. It’s that good. Now I wouldn’t run even Linux Lite – or any other Ubuntu-based distribution – without the Update Manager from unlockforus.com. Annnnnnd, I also have Ralphy’s best work yet – UnlockMe – installed. I wanted Waterfox instead of Firefox on my system (I think Firefox has been going out of it’s way to tick users off lately for some unknown reason). Open UnlockMe, click the Applications tab, find Waterfox, click. No PPA to add, it’s one of those “tarballs” that newbies find troubling at first. No need. It searched for a PPA. Finding none, it grabbed the tarball from Waterfox’s page, unpacked and installed it, and added it to the whisker menu! Automagically! I also used UnlockMe to get the coolest Dark Arc theme and Papyrus icon set that is equal in beauty and intuitive appeal to Faenza, but even better looking in my opinion. 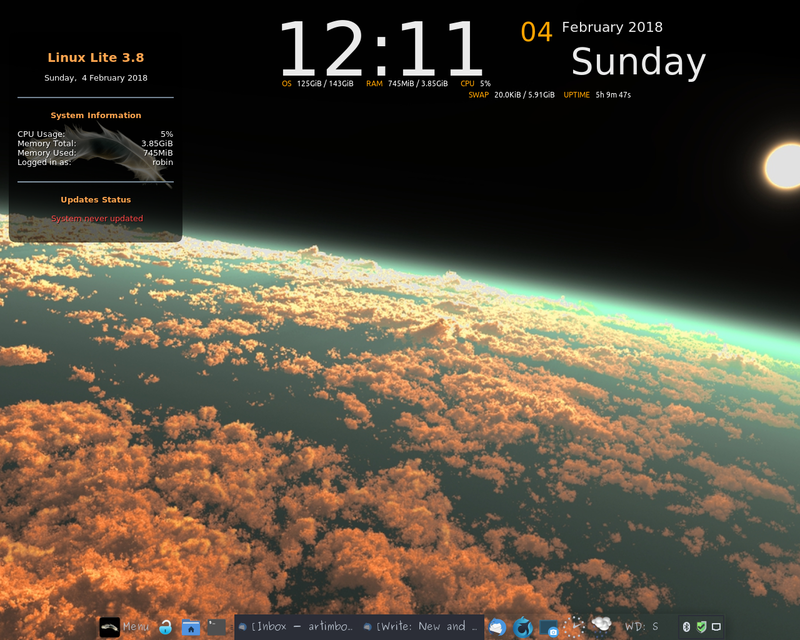 Got my usual analog clock and weather widgets in the Xfce panel, and I’m not quite through putting frequently-used stuff launchers on it, but I was too anxious to share this. Oh, y’see that second Conky panel there? I got it from UnlockMe too! Just look under Applications and install Conky Manager. Click, click, done. Simplicity is how I need and want things to be on my computer. I also want it fast and I want it to stay out of my way when I’m doing stuff. Linux Lite has a highly modified Xfce desktop that is absolutely without a doubt the leanest and easiest out-of-the-box configuration I have seen in any Xfce-desktop distro. I did enjoy Linux Mint Sylvia (Xfce), but LL is faster on modest hardware and comes with some cool tools that Mint doesn’t offer. I got those same wonderful Mint tools (MintStick, the Updater, etc) from “Ralphy’s Repo of Awesomeness” and added them to Linux Lite. I don’t think you can add Linux Lite’s supercool tools of awesomeness to Linux Mint, however, which is a big part of the reason I went back to Linux Lite after a 2-month flirtation with Mint on the new machine. Just read Robin’s review of Linux Lite 3.8. I think your blog is fantastic. Is there any way to read your entries sorted by date? Do you have a recommendation for screen tearing in LL?? Xfce has kinda had some long-standing issues with that. Some people have better performance using alternate window managers instead of the standard Xfwm. But the best place to ask this is in the Linux Lite forums. Linux Lite uses a highly modified Xfce desktop.